Our office was commissioned to create contemporary alterations and additions to an existing single level detached weatherboard Edwardian residence with a rear Western aspect in the Melbopurne suburb of Camberwell. The brief called for new living areas with improved aspect to the rear garden & swimming pool; upgrading existing bath rooms; improving internal circulation. Particular emphasis was given to the provision of sustainable technologies especially managing the at times harsh Western afternoon light. The design solution focused on the interaction with the garden and outdoor space while providing a series of operable screens to mitigate the West light. On entering the house, the main corridor provides an immediate view through to the rear garden. As the occupants proceed towards the rear, a series of views unfold. Windows, cabinetry, walls and ceilings were also strategically placed to unveil views and openings to the outside: the side garden to the North is framed by cabinetry; glimpses of the sky through a strip skylight; views of trees through high level windows; screened views to the Western outdoor areas. 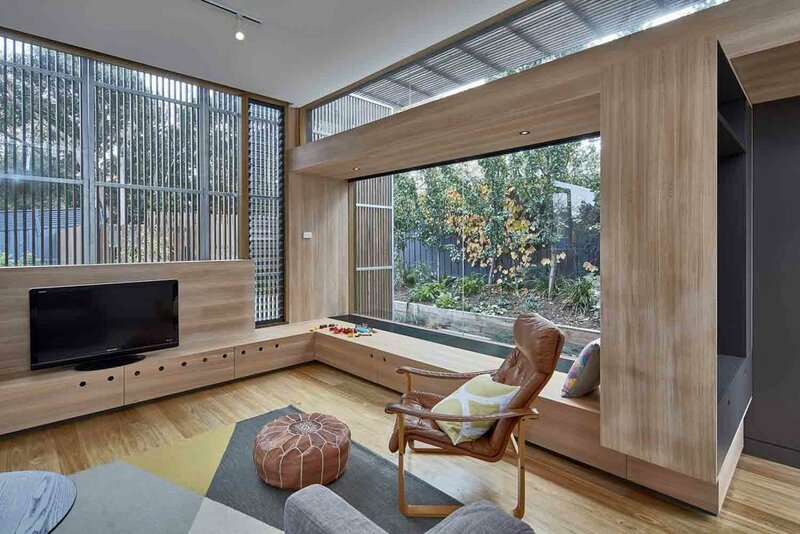 The timber screens provided filtered light to the interior while as well as visual surveillance of the pool area. The screens can be opened to maximise the afternoon sun during Winter as well as enabling maintenance to the façade.